Probably you are sick of looking at finished handknit socks, but for some reason (new colours every time? closure? too much time on my hands?) I am not sick of photographing them. These are the second pair I finished on my recent Saturday In Heaven - the one where I watched endless movies and didn't stop for anything chore-related. That sort of break makes me so much happier than one at the beach, maybe because I enjoy wearing wool. Although I did once live very near a beach and spent quite a few happy hours on it wearing wool - in fall and winter and very early spring because brrrrr: Canada. 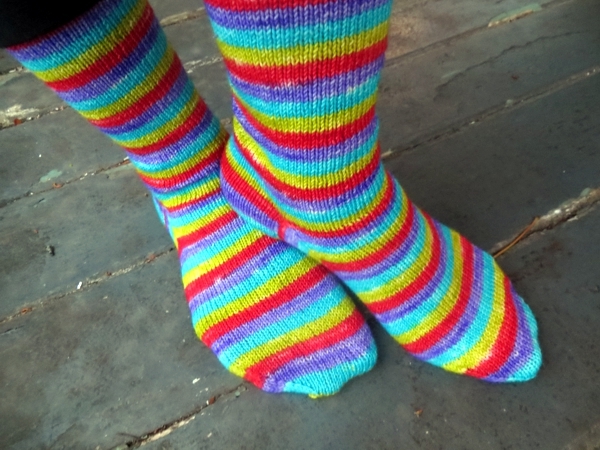 In spite of these needle-related hardships, the socks have come out really pretty as always, and their fabric is beyond luxury. 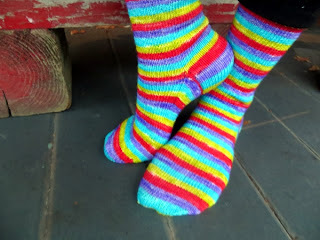 I know I knit a lot of of Vesper sock yarn with a few sides of Felix, from Biscotte et Cie - probably I should branch out more, but both those yarns are so fantastic I can't get up the energy to do it for socks in this weight. In fact, I just signed up for another season of the Vesper Sock Club and broke my rule - again - about buying Vesper straight from the shop. When you see what did me in you'll know why. And now that I'm back to knitting with my square needles I might even be able to catch up. Knitter's hope: it springs eternal. And in my case, stripey! Have a wonderful weekend and I will see you Monday, maybe even with something Not Vesper to show you, even though there might be something Very Vespery Indeed worth showing by then. I hope there is, and I hope you also have some terrific progress too. 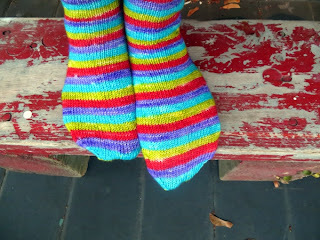 Sick of looking at handknit stripey socks--no way, just jealous! I wish that I loved sock knitting but it is something I do because its practical to wear and bring along everywhere. Honestly my heart belongs to lace. Ok. You have enticed me into trying out Vesper yarn. It always looks so yummy. Made the UpCountry Cowl again and just love that pattern.